We want to wish Fred Krush all the best in retirement. We will all miss having him around! 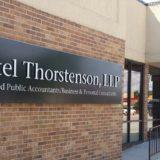 Fred joined Ketel Thorstenson, LLP in November of 2005. Previously, he served as the Director of General Services for McGladrey & Pullen in Rapid City. With experience in financial reporting, tax compliance, and tax planning, Fred has served 47 years as a CPA. Fred plans to fill his days with plenty of fishing, hunting and time with grandkids. Enjoy Fred, you have earned it.